This article sets out to contribute to the special issue devoted to multi-disciplinary legal research by discussing first the limits of purely doctrinal legal research in relation to a particular topic and second the relevant considerations in devising research that (inter alia) draws on non-legal, auxiliary disciplines to ‘fill in’ and guide the legal framework. The topic concerned is the (analysis of the) fundamental rights of minorities. 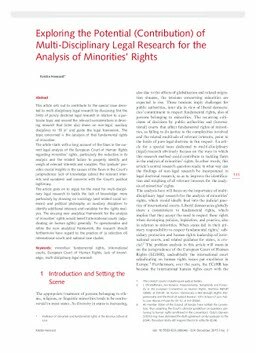 The article starts with a long account of the flaws in the current legal analysis of the European Court of Human Rights regarding minorities’ rights, particularly the reduction in its analysis and the related failure to properly identify and weigh all relevant interests and variables. This ‘prelude’ provides crucial insights in the causes of the flaws in the Court’s jurisprudence: lack of knowledge (about the relevant interests and variables) and concerns with the Court’s political legitimacy. The article goes on to argue for the need for multi-disciplinary legal research to tackle the lack of knowledge: more particularly by drawing on sociology (and related social sciences) and political philosophy as auxiliary disciplines to identify additional interests and variables for the rights analysis. The ensuing new analytical framework for the analysis of minorities’ rights would benefit international courts (adjudicating on human rights) generally. To operationalise and refine the new analytical framework, the research should furthermore have regard to the practice of (a selection of) international courts and national case studies.